The House of Representatives (衆議院, Shūgiin) is the lower house of the National Diet of Japan. The House of Councillors is the upper house. The House of Representatives has 475 members, elected for a four-year term. Of these, 180 members are elected from 11 multi-member constituencies by a party-list system of proportional representation, and 295 are elected from single-member constituencies. 238 seats are required for a majority. The overall voting system used to elect the House of Representatives is a parallel system, a form of semi-proportional representation. Under a parallel system the allocation of list seats does not take into account the outcome in the single seat constituencies. Therefore, the overall allocation of seats in the House of Representatives is not proportional, to the advantage of larger parties. In contrast, in bodies such as the German Bundestag the election of single-seat members and party list members is linked, so that the overall result respects proportional representation. The House of Representatives is the more powerful of the two houses, able to override vetoes on bills imposed by the House of Councillors with a two-thirds majority. It can be dissolved by the Prime Minister at will, the most recent was by Shinzō Abe on November 21, 2014. Japanese nationals aged 18 years and older may vote (prior to 2016, the voting age was 20). Japanese nationals aged 25 years and older may run for office in the lower house. The House of Representatives has several powers not given to the House of Councillors. If a bill is passed by the lower house (the House of Representatives) but is voted down by the upper house (the House of Councillors) the House of Representatives can override the decision of the House of Councillors by a two-thirds vote in the affirmative. However, in the case of treaties, the budget, and the selection of the prime minister, the House of Councillors can only delay passage, but not block the legislation. As a result, the House of Representatives is considered the more powerful house. Members of the House of Representatives, who are elected to a maximum of four years, sit for a shorter term than members of the House of Councillors, who are elected to full six-year terms. The lower house can also be dissolved by the Prime Minister or the passage of a nonconfidence motion, while the House of Councillors cannot be dissolved. Thus the House of Representatives is considered to be more sensitive to public opinion, and is termed the "lower house". Note that the composition of the ruling coalition may change between lower house elections, e.g. after upper house elections. Parties who vote with the government in the Diet, but are not part of the cabinet (e.g. SDP & NPH after the 1996 election) are not shaded. Under the 1889 Meiji Constitution which took effect in 1890 and established the Imperial Diet, the House of Peers functioned as an aristocratic upper house in a format similar to the House of Lords in the Westminster system, or the Herrenhaus in the Prussian government of the time (by then a state of the German Empire). 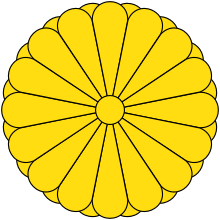 The elected House of Representatives served as the lower house of the Imperial Diet. In the Imperial Diet, both houses (and the Emperor) had to agree to legislation; even at the height of party-based constitutional government, the House of Peers could simply vote down bills deemed too liberal by the oligarchy such as the introduction of women's suffrage, increases in local autonomy or trade union rights. The government and the prime minister leading it were neither responsible to nor elected by the Imperial Diet. But the right to vote on (and if necessary block) legislation and more importantly the budget gave the House of Representatives leverage to force the government into negotiations. After an early period of frequent confrontation and temporary alliances between the cabinet and political parties in the lower house, parts of the Meiji oligarchy more sympathetic to political parties around Itō Hirobumi and parts of the liberal parties eventually formed a more permanent alliance in form of the Rikken Seiyūkai in 1900. The confidence of the House of Representatives was never a formal requirement to govern; but in fact between 1905 and 1918, only one cabinet took office that did not enjoy majority support in the House of Representatives. During the Taisho Political Crisis in 1913, a "no-confidence vote" against the 3rd Katsura Cabinet, accompanied by major demonstrations outside the Diet, was followed shortly by resignation. Subsequently, in the period often referred to as Taishō democracy, it became increasingly customary to appoint many ministers including several prime ministers from the House of Representatives – Hara Takashi became the first commoner as prime minister in 1918. 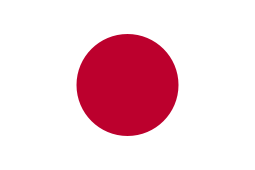 In the same year, the Rice Riots had confronted the government with an unprecedented scale of domestic unrest, and a socialist revolution brought the Prusso-German monarchy to its end, the very system Meiji oligarchs had used as the main model for the Meiji constitution to consolidate and preserve Imperial power. Even oligarchs formerly fundamentally opposed to political parties such as Yamagata Aritomo became more inclined to cooperate with the [still mainly bourgeois] parties to prevent a rise of socialism or other movements that might threaten Imperial rule itself – socialist parties would not be represented in significant numbers in the lower house until the 1930s. Influence of the House of Representatives on the government increased, and the party cabinets of the 1920s brought Japan apparently closer to a parliamentary system of government; but while there were several reforms to the upper house in 1925, the equal balance of powers between the two houses and the influential role of extra-constitutional actors such as the Genrō (who still selected the prime minister) or the military (that had brought down several cabinets) remained in essence untouched. After the Imperial Army had invaded Manchuria in 1931, within less than a year following several assassinations and coup attempts, party government was replaced by "national unity" (kyokoku itchi) cabinets which were dominated by nobles, bureaucrats and increasingly the military. After the start of the war in 1937, the influence of the Imperial Diet was further diminished, though never fully eliminated, by special laws such as the National Mobilization Law and expanded powers for cabinet agencies such as the Planning Board. The House of Representatives in the Empire had a four-year term and could be dissolved by the Emperor. In contrast, members of the House of Peers had either a lifetime mandate (subject to revocation by the Emperor) or a seven-year term in the case of members elected in mutual peerage elections among the three lower peerage ranks, top taxpayer and academic peerage elections. During the war, the term of the members of the House of Representatives elected in the last pre-war election of 1937 was extended by one year. The initially very high census requirement for suffrage was reduced several times until the introduction of universal male suffrage in 1925. The electoral system to the House of Representatives also changed several times fundamentally: between systems of "small" mostly single- and few multi-member electoral districts (1890s, 1920, 1924), "medium" mostly multi-member districts (1928–1942) and "large" electoral districts (usually only one, rarely two city and one counties district per prefecture; 1900s and 1910s), using First-past-the-post in single-member districts, Plurality-at-large voting (1890s) or Single non-transferable vote in the multi-member districts. In the last general election to the House of Representatives of the Empire in 1946 under U.S.-led Allied occupation, women's suffrage was introduced, and a system of "large" electoral districts (one or two per prefecture) with limited voting was used. A change in the electoral law in April 1945 had for the first time allocated 30 seats to the established colonies of the Empire: Karafuto (Sakhalin), Taiwan and Chōsen (Korea); but this change was never applied in a House of Representatives general election. Similarly, Korea and Taiwan were granted several appointed members of the House of Peers in 1945. In 1946, both houses of the Imperial Diet (together with the Emperor) passed the postwar constitution which took effect in 1947. 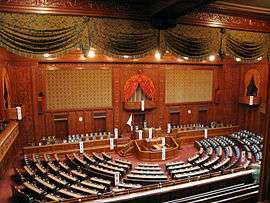 In the National Diet, the House of Peers would be replaced by an elected upper house, the House of Councillors, and the House of Representatives is now able to override the upper house in important matters. The constitution also gave the Diet exclusive legislative authority (without the Emperor) and explicitly made the cabinet responsible to and the prime minister elected by the Diet. ↑ "Diet enacts law lowering voting age to 18 from 20". The Japan Times. ↑ The number of seats reduced from 480 to 475 compared with the last election. ↑ The Cambridge History of Japan, Vol.6, chapters 2 (Taichirō Mitani: The establishment of party cabinets, 1889–1932) and 3 (Gordon M. Berger: Politics and mobilization in Japan, 1931–1945).